I don't wear blazers or tailored jackets very often, but when I do, they instantly make me feel more polished, professional, and grown up. Naturally, I'm wearing mine dressed down with a comfortable tee and stretchy skinny jeans. 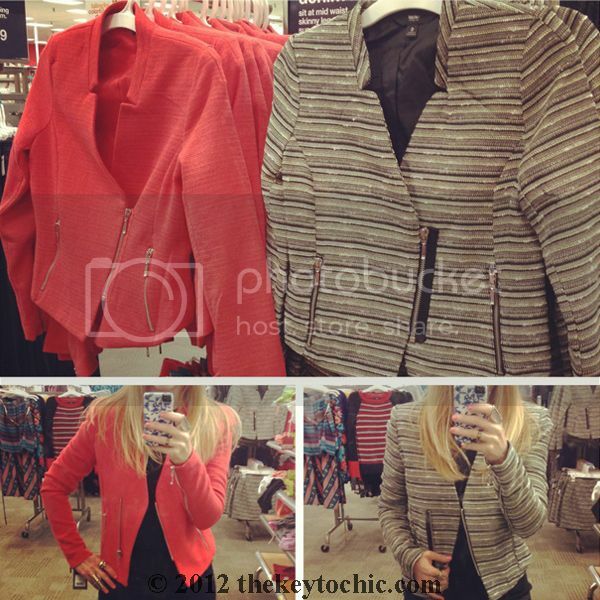 If you follow on Instagram (@thekeytochic), then you may have seen my indecision about whether to buy the jacket in red or in gray. The silhouette reminds me of the chic blazers that Zara sells for triple and quadruple the price. For the affordable price of this one, I just might go back for the red version. While I don't usually blog about beauty notes, you might notice a change in my hair color. I'm switching things up courtesy of my talented stylist with a golden base color and lighter ends for an ombré 2.0 if you will. Long before I started this blog, I experimented with a few versions of the dark to light ombré trend. This time around, it's a more subtle effect combined with light layering and sideswept bangs that after much debate, I've decided to grow out. New season, new hair!